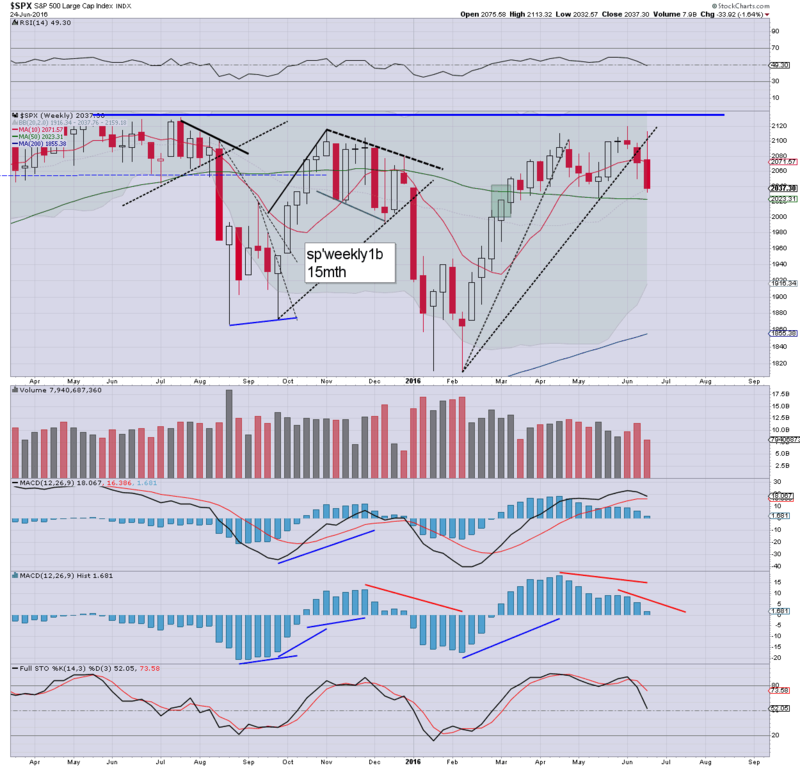 With capital markets shocked by the BREXIT, US equity indexes saw net weekly declines, ranging from -3.6% (Transports), -1.6% (sp'500, Dow, NYSE comp'), to -1.5% (R2K). The bull maniacs have seen yet another failure to break up and away. 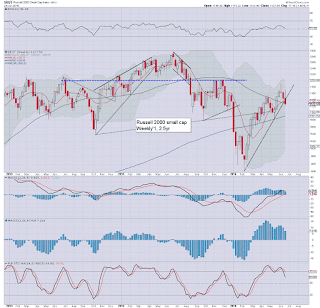 Near term outlook offers downside to the 1950/25 zone, and eventually the 1600s. 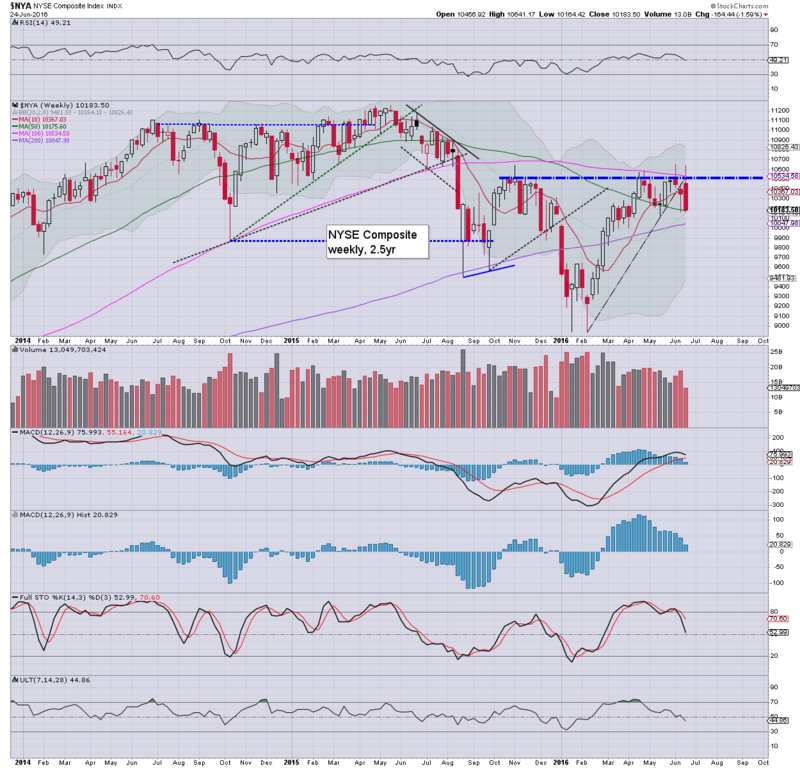 The sp'500 closed Thursday at 2113, a mere 1.1% from the May 2015 high. Yet the BREXIT outcome resulted in a very significant Friday gap lower, with the sp' seeing a net weekly decline of -33pts (1.6%) at 2037. Underlying MACD (blue bar histogram) ticked lower for a third consecutive week, and is set to turn negative - with a bearish cross, at next Monday's open. Best guess: A break of the critical low of 2025, spiralling lower to the 1950/25 zone, before the July 4th holiday weekend. 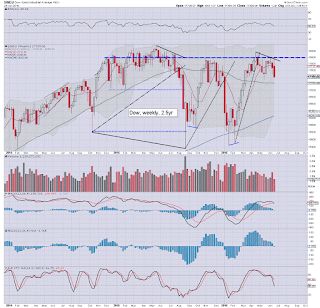 The Feb' low of 1810 will be tough to break, but the giant monthly cycles are offering the 1600/1500s by the early autumn. 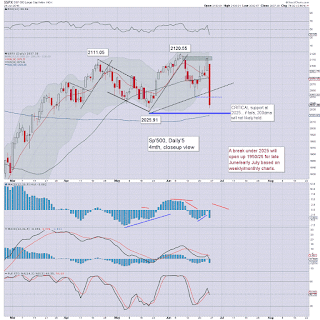 The tech' saw a third weekly decline, -1.9% in the low 4700s. Next support is around 4500, which is a clear 4% lower. 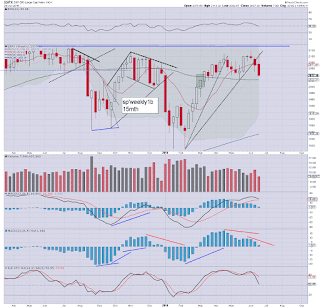 The 4100s are possible, but that is over 10% lower, and would equate to sp'1850/00. The mighty Dow settled -274pts (1.6%) @ 17400. 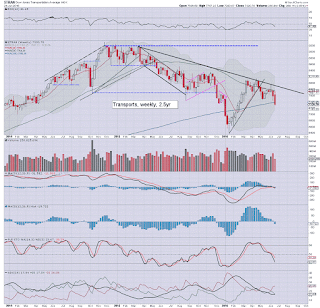 With the strong Friday decline, the Dow saw a bearish MACD cross. First soft target is the 17K threshold, and then 16600/500s. 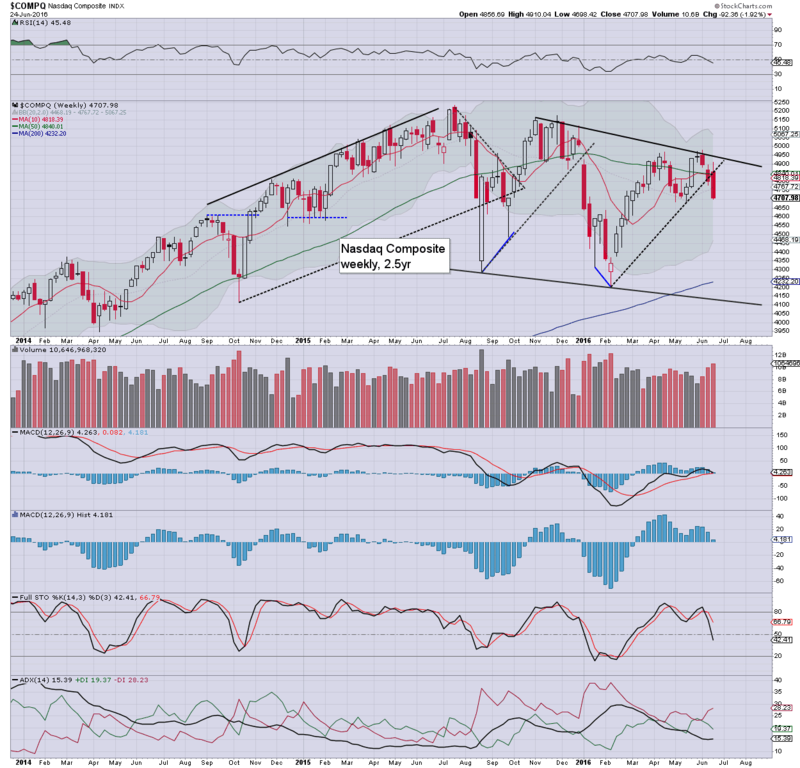 The Aug' 2015 low of 15370 is going to be tough to hit in the current down wave. The master index settled -1.6% in the 10100s. 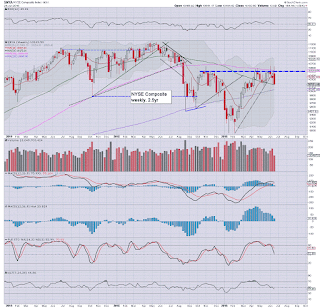 The weekly candle has a very notable spiky top, and is highly suggestive the 10K threshold will be broken into end June. 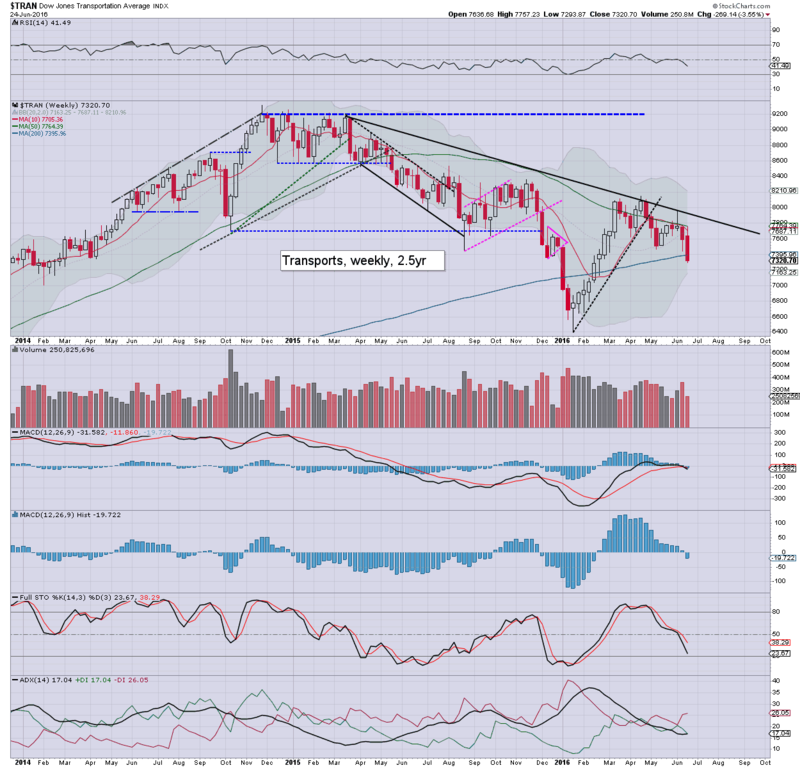 From there, first downside are the 9600/500s, with a grander target of 8K, which is a clear 20% lower.. equiv' to sp'1600s. 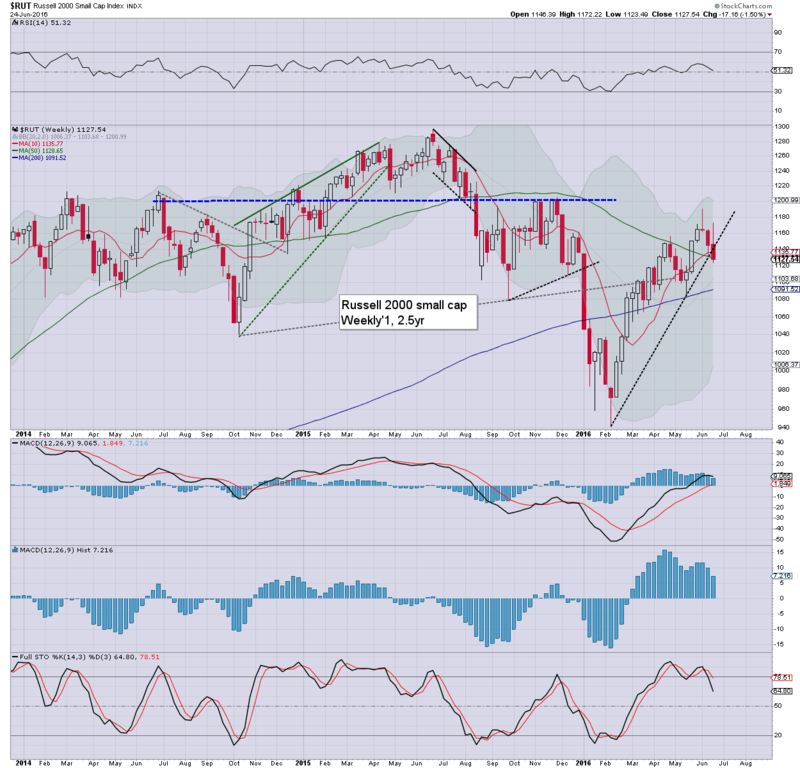 The second market leader - R2K, has followed other indexes, and broken rising trend, settling -1.5% @ 1127. At the current rate of decline, there will be a weekly MACD bearish cross in six trading days - July 5th. Next soft support is the May low of 1085.. almost 4% lower. From there, the 1050/40 zone in first half of July. The giant monthly cycles are offering mid term capitulation in the 800s. The 'old leader' - Trans, continues to lead, swinging from 7757, to settle -3.5% in the 7300s. 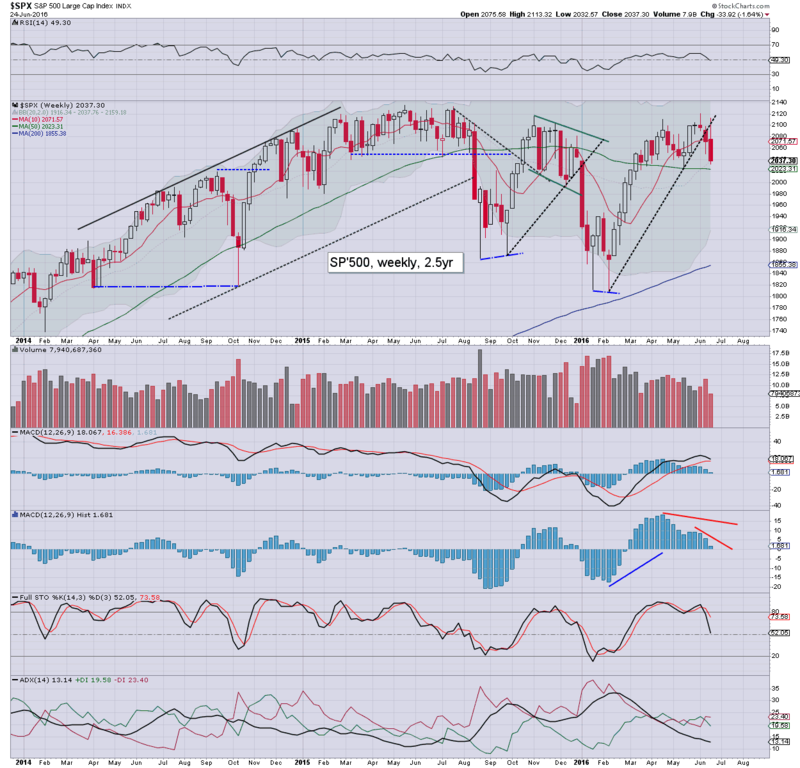 With a severe Friday decline of -4.6%, the weekly MACD cycle has turned negative. 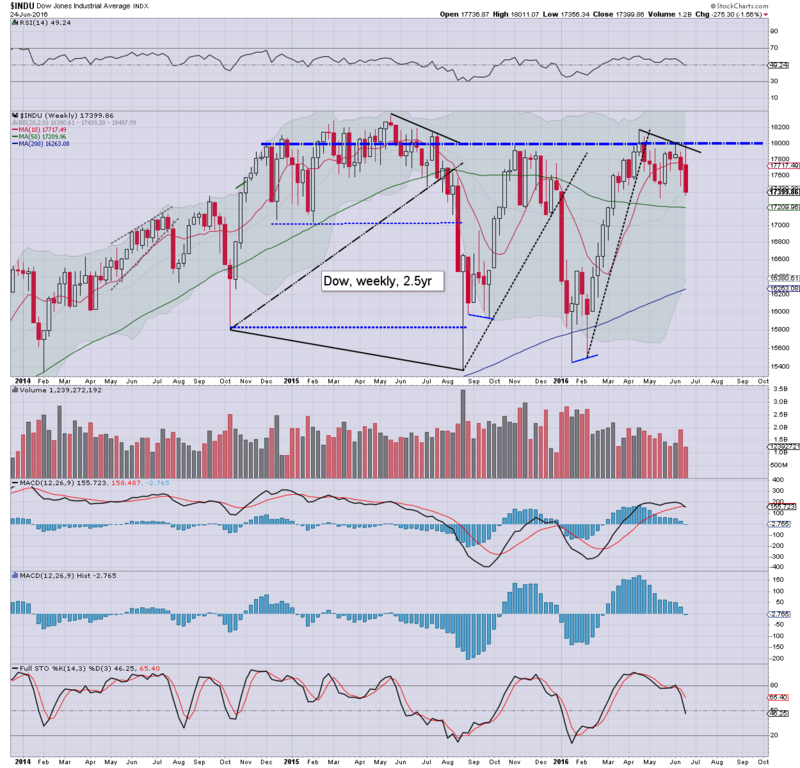 A break of 7K looks due, and that will offer a test of the Jan' low of 6403 in July/August. Grander downside is the 5500/5000 zone. 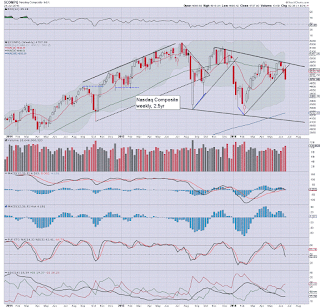 A very bearish weekly close for all US equity indexes. The weekly candles are of the bearish engulfing type, all have spiky tops, which is highly indicative of another failure by the equity bull maniacs to break decisively upward. Further powerful downside looks highly probable next week, on the order of 3-4%. Another busy week is ahead, not least as the market will still be reeling from the UK vote. *Yellen, Carney (BoE), Draghi (ECB), and Tombini (BoB), are having a little central banker get together in Portugal, and that will likely get considerable TV coverage in the morning. *Bullard is appearing in London around 2pm, at a dinner function of the society for business economists. Thursday is June 30th, and there will be some end month/quarter trading issues. Vol' will likely be higher, and price action will tend to be more dynamic. The following Monday will be July 4th, when the US market will be closed. Friday trading will tend to be somewhat lighter.. and that will likely favour the equity bulls. If you have valued my 11000+ posts across the past four years, you can support me via a subscription, which will give you access to my ongoing intraday posts. See HERE for details. *the next post on this page will be Monday @ 7pm. 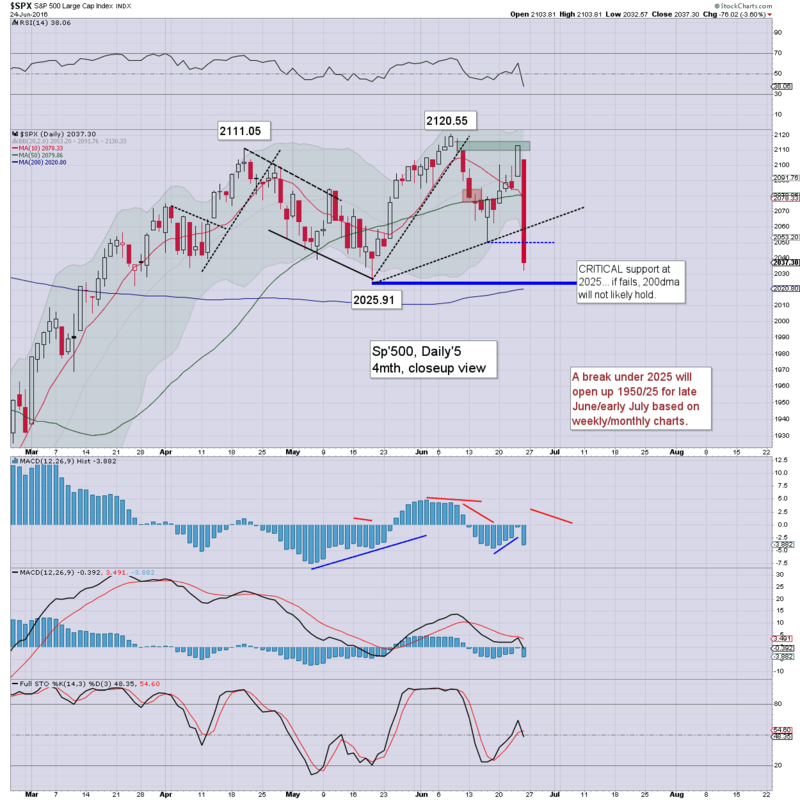 US equity indexes closed severely lower, sp -76pts at 2037 (intra low 2032). The two leaders - Trans/R2K, settled lower by -4.6% and -3.8% respectively. 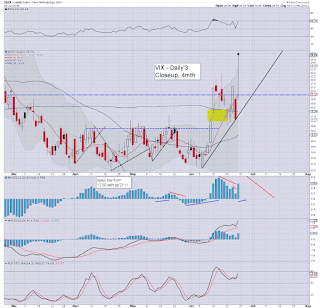 VIX settled higher by an extremely powerful 49.3% @ 25.76. Near term outlook threatens a major Monday gap lower under 2025, to the 1950/25 zone, before the July 4th three day holiday break. The Thursday close teased the bull maniacs with a viable gap to new historic highs on a 'remain' vote... but no, instead the UK populace voted to leave the EU. The BREXIT has resulted in a massive reversal, with the market swinging from sp'2113 to 2032. The key low of 2025 looks set to be broken under next week. 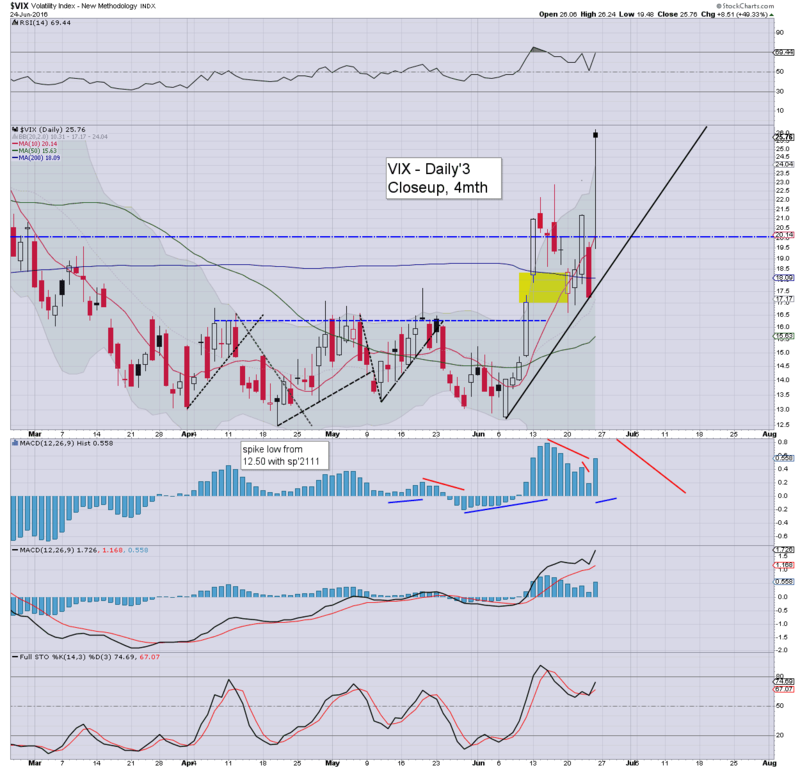 VIX is showing some hyper upside power, although in the scheme of things, the 25s are still relatively low, 30s look a comfortable upside target next week. The weekly candle is important to reflect upon, as we have a massive spiky top, highly indicative of an epic failure to break up and away. Underlying MACD (blue bar histogram) cycle is set for a bearish cross at the Monday open, and by default.. that is suggestive of more powerful downside next week. 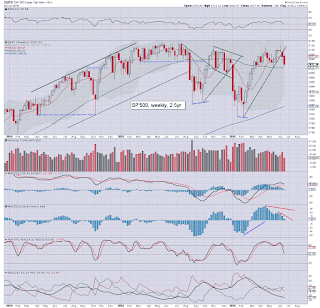 The lower bollinger band will be in the 1920/30s next week... and is a very valid target. Regardless of next Monday's open... we're seemingly headed to the 1950/25 zone.... real soon.